Here’s a real throw back to October of last year when I had the opportunity to meet up with the O family again! I met momma O before little man was born and did their maternity and newborn photos! This time we were back for a 6 month update, family photos and some pumpkin patch fun!! The top pics were actually at the very end. The boys were batman and his sidekick for Halloween and momma just had to get a few of them in their get up. 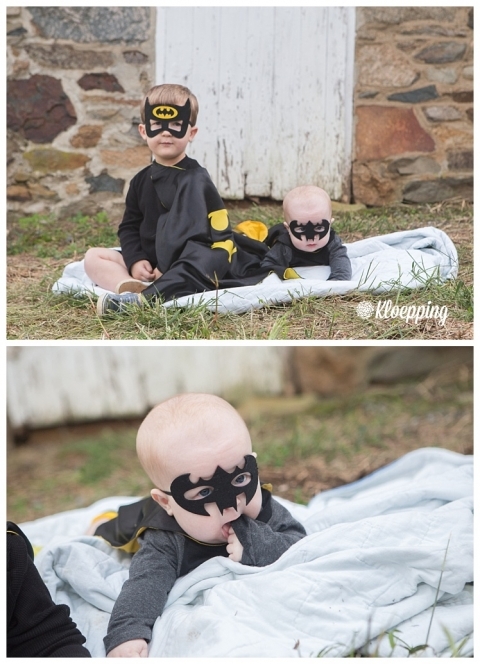 Big brother LOVES his super heros and capes (as evidenced by some of the photos from their maternity session). We only managed a few because the light was dying and the kids were fading as well. I’m glad we tried though, I love these! Big brother P is a hoot and a half and the perfect gentleman when I ask him to smile. I told him to stand behind mom and dad and give them a hug and this is what we ended up with. We’re so lucky in Northern Va with so many wonderful options for family photos. We actually drove out into the country to a lesser known pumpkin patch who was amazing and open with letting us take over the patch to shoot. We picked this lesser known one because momma has shared a pic with me like the one above. I figured we wouldn’t want to strip him down and plunk him between a bunch of pumpkins in full view of everyone (haha). I love that she’s game for fun things like this (totally her idea and I love it!!) I think this was my favorite shot of the season. I can’t believe that little man is going to be 1 here very very soon and we get to meet up again for a cake smash!! Stay tuned for more shenanigans and fun!